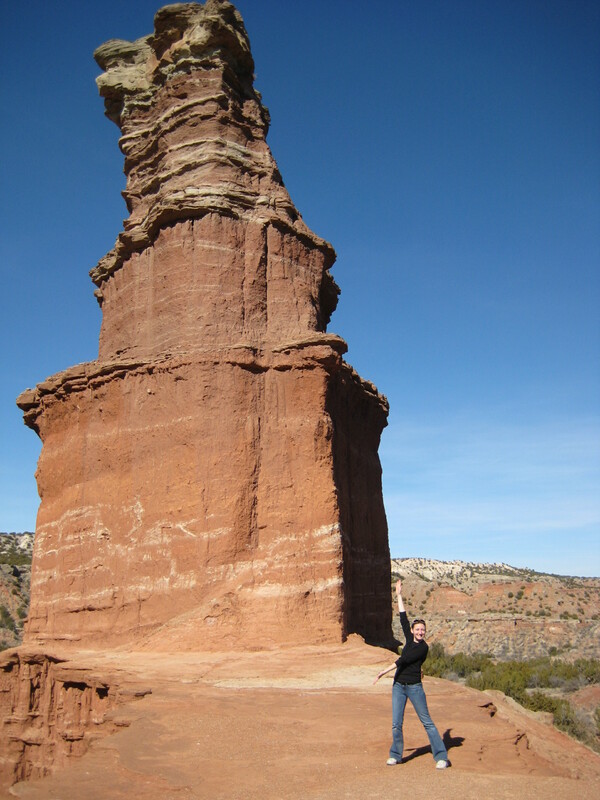 Last weekend, I hiked the Lighthouse Trail in Palo Duro Canyon near Canyon, Texas, with my friend J. Me with the Lighthouse. It is so beautiful up there. The trail starts immediately off a parking lot at the bottom of the canyon. The drive down gave a great overview of the canyon including beautiful views of the rock layers. The Palo Duro is the second largest canyon in the U.S. The Lighthouse trail follows the bottom of the canyon around some beautiful bluffs. It crosses a stream bed several times over the course of the 6 mile round trip. The last three-quarters of a mile is the only truly challenging part of the trail with a very steep incline covered in sand that makes it slippery. Going up wasn’t terribly hard, although by the time I got to the top I was completely out of breath. One more short incline later found us on a plateau between two huge rock formations. One, more dramatic and steep, is the lighthouse, but it’s companion is also gorgeous. There isn’t a way to climb to the top of the lighthouse. The plateau is plenty wide to avoid fears of falling off, but both sides drop off pretty steeply to the floor of the canyon. If you decide to do this hike, dress in layers that you can easily shed. At the top the canyon, it was chilly, but at the bottom was much warmer. I was steaming in my long-sleeved t-shirt and jeans. Take plenty of water, and wear good hiking shoes. If you are going all the way to the top, make sure you can fit everything you’re carrying into a backpack. I needed my hands several times to get to the top of the last steep hills. I love hikes like that because it is not so challenging that I can’t enjoy the scenery, but it’s tough enough that when I got done my legs were burning. I’m sitting on the edge with my legs hanging off the edge. That little tiny dot? That’s the end of the hike.